trentbarton are on the look-out for customers with ‘attitude’ to help launch a fleet of new buses coming soon to the popular rainbow 4 service. And whilst on a visit to us recently, Nottingham South MP, Lilian Greenwood kicked off the search as part of preparations for the introduction of the swish new vehicles. Commercial Director, Alex Hornby said: “We have a great relationship with our customers and they’re the best people to promote our services to others. We know local people get a real kick from seeing their faces on our buses after previous successful campaigns and we’re looking for more people to take pride of place on our new fleet. We were delighted when Lillian said she’d help us to promote the initiative. Customers have already played a key role in the development of the brand new, eye-catching bus design that is taking the transport industry by storm. As well as enjoying a comfortable ride on seats trimmed in a specially designed fabric with leather embossed seating, passengers are set for a quiet journey thanks to double-glazed windows, whilst safety is boosted by an on-board, six-camera CCTV system. 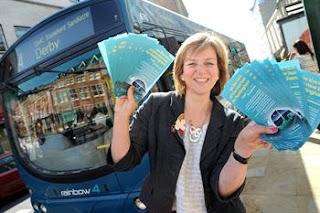 In May, the first of the new buses will go into service on rainbow 4 which runs every ten minutes between Nottingham and Derby via Sandiacre and Stapleford. Link from Richard Lomas - Welcome back Richard!